We are really enjoying our CSA share this year from Red Fire Farm in Granby, MA. We are still wasting some produce, but for the most part, we’re increasing our utilization each week. On the weeks we eat out more often, we’re obviously struggling more… so all the more reason to cook at home! Week 4 brought cucumbers! We love cucumbers in our house and these little cukes were super crunchy and went fast. I am also in love with the pearl onions they have been sending us. I hope they keep coming! They are about the size of a walnut to a small apricot and are very mild and absolutely delicious. I have yet to do anything with the summer squash… it’s sitting in the fridge downstairs and I’m hoping it’s still good. I always find it a challenge to use up zucchini and summer squash… but I found an interesting recipe for a “raw spaghetti” — it uses zucchini ribbons as noodles and raw, fresh, heirloom tomatoes in the sauce. My goal is to make it this week. Week 4’s parsley went into my Weight Watcher’s Potato Salad Sunday night. For being over a week old, it held up really well. One of the cucumbers was used in my Cucumber, Mango and Chickpea salad on the 4th of July. The rest were gobbled up with just a little salt! When week 5’s bounty arrived, I stood staring at it — determined to waste as little as possible this week — which meant, doing something with it immediately. I decided to shred the cabbage and make an Asian-inspired slaw, that way I could also add the cucumber, green onions and green kohlrabi to it. It wound up being a fine idea! 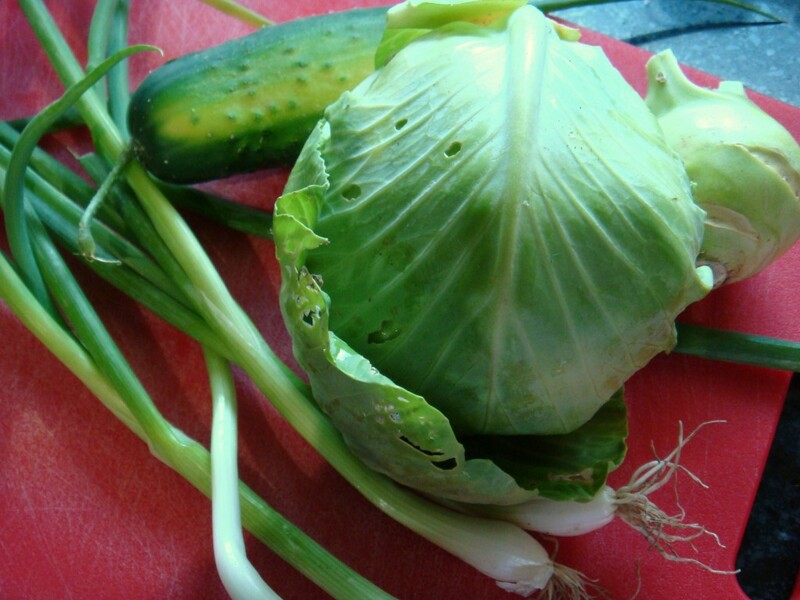 To shred the cabbage, you can use a grater or just a sharp knife to slice thinly. I used a knife. 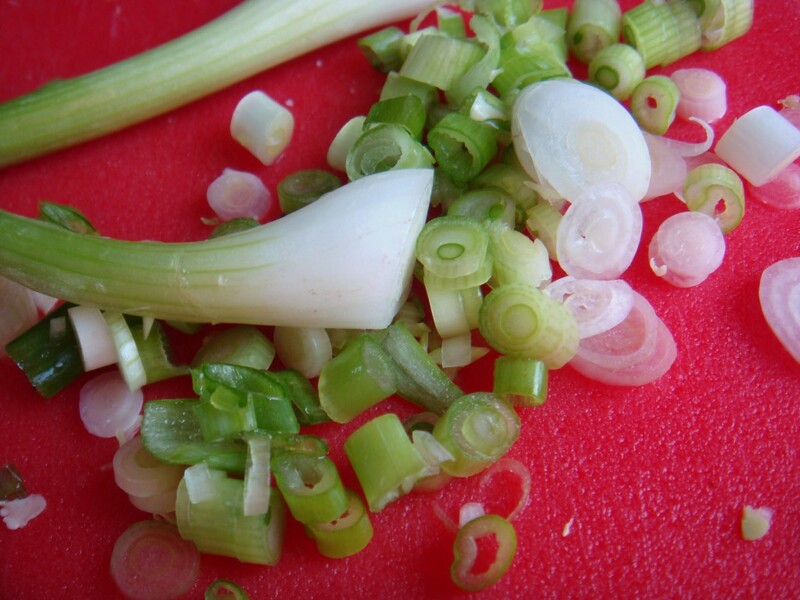 The green onions that came with our share were a nice size and had big bulbs, so if you’re using thinner, smaller onions, I recommend using more than just three — as they added a nice flavor to this slaw. Combine shredded cabbage, chopped cucumbers and kohlrabi, sliced onions and toss to mix. In a separate bowl, combine oils, vinegar, salt, pepper and sesame seeds. Whisk to mix evenly and pour over salad. Toss to coat. Serve immediately. 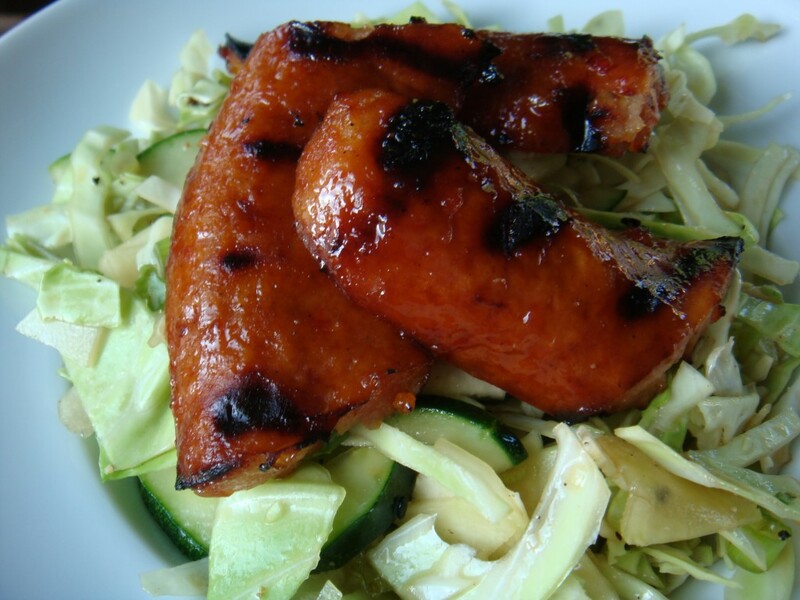 I served the slaw under some chicken kielbasa that I marinated in a (bottled) sweet Thai red chili sauce and then grilled. It was a scrumptious combination! By the way, we LOVE this kielbasa! It’s the Hilshire Farms Chicken Kielbasa… it’s juicy, smokey, flavorful and much lower in fat and calories than its pork counterpart. I highly recommend it. Lesson learned: Must pick up veggies myself, rather than sending husband. D has gone for me the last two weeks because the pickup location is sort of on his way home. The first week, he had the option of getting a head of cabbage, but grabbed the collards instead. No comment. Then this past week, he literally brought home 3 little peices of basil (all three were the flower heads!) because he knew I had a basil plant sitting on our kitchen windowsill at home. Sigh… you can never have too much basil!! !